It’s important to find a high quality, functional rifle scope for an AR-15. People enjoy the AR-15 rifles for the fact that it enables them to make extremely accurate shots. However, this is best done with the attachment of a great rifle scope. In this article, we are going to give you an idea of what to search for when shopping for the best rifle scope and list some of the top brands in the business. Toward the end, we will provide you with rifle scopes that are available on Amazon and what’s out there for several types of budgets. So, if you’re confused on where to start in shopping for a rifle scope, don’t fear! We are here to help you get a great start! There are several things to consider when you’re looking for the best rifle scope for your AR-15. First, what are you using the rifle for? The purpose of your target is very crucial in determining which rifle scope to purchase. Rifle scopes are created with different strengths and abilities depending on the nature of your scenario. For example, if you’re a deer hunter, it may be best for you to find a rifle scope that’s created for shorter ranges yet shows you a broad view of the scene. This is very beneficial since your target is likely to be moving. Even further, finding rifle scopes that offer the red dot is a significant aid to moving targets like deer. It gives you the ability to keep up with the game and produce an accurate shot. In other words, you will know exactly where the shot is aimed. While we are speaking of the red dot, also known as the reticle, there are thousands of products to choose from. It ‘s nice to have variety, but that can make it difficult when you don’t know which one to choose. Overall, you will want to choose a reticle that best enhances the purpose in which you’re using the rifle for. For instance, we have already used the example of deer hunting. If that’s the nature of your rifle use, then you’ll want to have a reticle in your rifle scope that best suits the needs for moving targets. Typically, you will want to choose a reticle that has adjustable color and brightness. This makes it super easy to use in any lighting situation whether it’s daylight or moonlight. In fact, many hunters prefer something that’s called, “gradual distance reticle” in which there’s a hash mark for every few distances. This gives the hunter a real advantage in finding and shooting the target as they can choose a mark due to the distance of the moving target. As far as color is concerned, most reticles are red (hence the nickname, “red dot”) but are also popular in the colors of black and green depending on the strength. In fact, there are scopes that have rangefinders built in them that allow the shooter to instantly know the distance to his moving target. Why is it important to know the distance of a target? Any experienced shooter will tell you that it’s crucial to know the distance since it allows you to consider the natural elements surrounding you that could affect your shot. This includes elements such as wind or rain. The wind can certainly have an impact on an accurate shot if the shooter doesn’t aim and prepare for its involvement in the movement of the shot. All of these details are why it’s so important to consider the reticle when you’re shopping for the best rifle scope. Magnification is another detail to consider when you’re shopping for a great rifle scope. There are many options to consider when researching the magnification. The better the zoom, the more that the image will distort. Keep in mind that there are many different scopes that aid in the process of reducing the distortion but the kind you purchase will depend on the specific needs of your rifle. As we have already mentioned, there are many different purposes for the shooter. The most common is game hunting. Since hunters often deal with a moving target, regarding magnification on the scope, it’s best to find one that has a greater zoom than most. This will increase the odds of accuracy. It’s interesting to note that some rifle scopes are colored in emerald to allow for the magnification of light. It promotes excellent visibility during darker scenarios and environments and also creates a more clear view with the higher magnification. There are also rifle scopes that don’t have as much magnification and are used for shorter firing distances and ranges. It’s in those type of situations where clarity is more necessary than magnification. Again, it all comes down to the purpose and nature of the rifle’s use. Depending on your shooting scenario and ordeal, there’s a rifle scope for every need. There are several great brands of rifle scopes that are very popular today. Let’s name a few so that you can be familiar with them before we progress any further. Bushnell has long been around for consumers that are in need of tactical and rifle products. There’s no doubt that they provide some of the best rifle scopes on the market. They offer high-quality rifle scopes for nearly any budget, big or small. 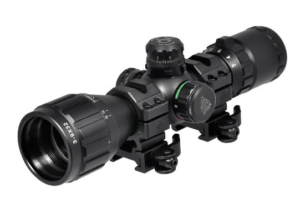 Armasight is a mega name in rifle scopes and other tactical products. They provide consumers with high-quality rifle scopes that are used frequently in the professional settings as well as the hobby settings. Their brand has pricey rifle scopes as well as affordable rifle scopes. They’re worth checking out if you’re searching for the best of the best. UTG is seen a lot in the rifle scope community. They offer a budget friendly variety of high-quality rifle scopes. If you’re concerned about the budget but don’t want to compromise quality, this is the brand to consider. Let’s face it, Nikon is known for many things when it comes to cameras, telescopes, rifle scopes and more. As far as rifle scopes are concerned, it’s gentle on the wallet and doesn’t compromise the great quality. Vortex is a great brand for rifle scopes in that it provides excellent quality products with great prices. Aimpoint is up there with Armasight. They offer high-quality rifle scopes but their pricing may be slightly higher than some folks care to spend. However, the quality certainly isn’t compromised as they do offer some of the best rifle scopes in the business. If you’re on a tight budget but need to find a great rifle scope for your AR-15, then this may be the product for you. The UTG Bug Buster is available for under $100 and has a wonderful star rating on Amazon. It comes with a fully sealed design and is 100% nitrogen filled. It’s perfect for any environment as it’s rain, fog and shock proof! Even better, it comes with the dual red and green illumination as well as conveniently providing eye relief for all hunters and shooters that are in different weather and environmental conditions and scenarios. You’d enjoy knowing that it comes with a one-inch tube with an emerald coating that allows for the maximum light transmission. It also has a premium zero lockable and turrets that are allowed to be reset time and time again. They come with a 1/4 MOA per click adjustment. As far as range is concerned, it has an adjustable objective that extends from 3 yards to infinity! The UTG Bug Buster also comes with a two-inch sunshade, detachable rings, and high-quality flip-open lens caps. For your convenience, it’s ready to use straight from the box! For a high price under $100, the UTG Bug Buster is a rifle scope that offers an excellent function for a low price! As for the reviews on the UTG Bug Buster, most of the customers were very pleased with the quality of the scope for the low price. There wasn’t negative to say about the product. Let’s take a look at a great rifle scope that’s available for under $200. The Nikon P-223 has a stellar rating on Amazon as well as an affordable price! Available for under $200, this rifle scope has a lot to offer. Let’s take a look at the nitty gritty details. The Nikon P-223 is waterproof, and fog proof and O-ring sealed. This makes it perfect for nearly any environmental scenario such as rain, fog or sunshine. It has a BDC 600 reticle that provides the rifleman with a special open circle for aiming points. The hash marks are from 100 to 600 yards. In fact, the BDC 600 reticle is designed for the curve of the .223 Rem/5.56 NATO round with a 55-grain, polymer tip bullet. This is one reason that many of the AR-15 lovers enjoy the Nikon P-223. 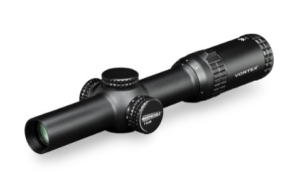 This high-quality rifle scope also comes with a 1/4 MOA hand-turn. The Zero-Reset Turrets reticle adjustments are incredible with helping you get a great aim on your target faster. Even better, it ensures that you can maintain your setting so that accurate shots are made the first time. This performance is guaranteed even through repeated recoil. The Nikon P-223 has an amazing 100-yard Parallax setting that is useful and beneficial for precise shooting. Finally, are you worried about your brow? No worries. It’s designed with constant eye relief that’s guaranteed to keep your brow safe from all rough movements, difficult shooting angles, and heavy recoiling cartridges. Let’s take a look at what the customers are saying about the Nikon P-223. It’s nearly impossible to find a single, bad review on the Nikon P-223. Overall, the major detail that customers love about this particular rifle scope is the extreme clarity in low light situations. 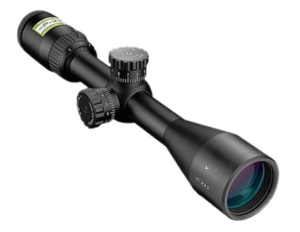 If you enjoy early morning or nightly hunting trips, this would be a great rifle scope for you! There are many high quality rifle scopes for under $300. Let’s take a look at one that’s available on Amazon. The Bushnell AR Optics has a high star rating on Amazon and is available for an affordable price below $300. What makes this particular rifle scope a winner is that it offers a ton of available details and functions at a meager price. Now that’s a deal! Let’s take a look at the many features and qualities of the Bushnell AR Optics Rifle Scope. The Bushnell AR Optics 1-4 24mm BTR-1 scope is prepared to give you the accuracy needed to have that successful shot! The illuminated reticle is calibrated and designed for use with 5.56 rounds. The BDC ensures that you have accurate aiming, detailing and ranging up to 600 meters. You can make super fast power changes with the Throw Down PCL lever. It comes with multiple coated optics that provide brilliant brightness and an incredible eyepiece that functions with fast focusing skills for the best accuracy. The Bushnell AR Optics is infused with nitrogen and sealed with an O-ring so that it will prevent any moisture or dust from seeping into the lens. As for the external structure and durability, it’s built of sturdy aluminum alloy. It’s finished and sealed with an anodized coating to protect the inside from any external elements. Additionally, it’s rustproof and scratch proof! This allows you to keep a crisp, clean and beautiful piece of tactical equipment for an extended period of time. As for the scope rings, it’s best to check the clearance on your particular rifle before choosing your scope rings. Typically, medium height scope rings offer the necessary clearance that eliminates contact with the scope base and cap of the rifle. However, it’s best to be sure and double check before choosing the scope rings for the Bushnell AR Optic. There’s a small chance that the Bushnell AR Optic’s erector cap assembly may lower the odds to use low scope rings. 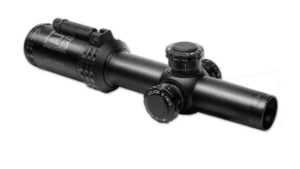 What are the customers saying about the Bushnell AR Optics Rifle Scope? Customers love the fact that the lens is super bright and delivers high accuracy with every performance. The only surprise that customers had about the Bushnell AR Optics was the heavier-than-expected weight. If you’re okay with a somewhat heavier rifle scope, then you’ll love it! If you’re searching for the perfect rifle scope for under $500, then we have found a great option for you on Amazon. The Vortex Optics Strike Eagle has a stellar star rating on Amazon and even comes with a free camouflage style hat. The Vortex Optics Strike Eagle is created for speed and reliability. It’s great for hunters and shooters that need an an assistant in reaching targets from a variety of ranges whether it’s point blank or long extended ranges. It’s reticle sub-tensions are used for estimating the range and wind drift correction. This ensures that the shot is accurate at the highest magnification. The Strike Eagle rifle scope is constructed with the utmost in quality with fully, multiple colored lenses that ensure you have a precise, clear sight of the target.This increases the light transmission through the several anti-reflective coatings. 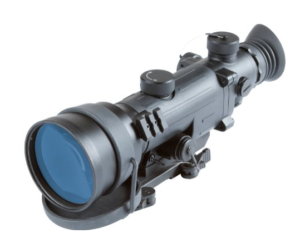 Its reticle is glass-etched thus protecting the two layers of glass for excellent reliability and durability. The illuminated reticle offers incredible aiming precision for low light situations and conditions. The single piece, 30mm tube allows for the maximum alignment that encourages sharp accuracy and tremendous optical performance. Even better? The Strike Eagle offers sturdy durability with its waterproof construction. This ensures that you can use your rifle scope reliably whether in dry or wet conditions. What are the customers saying about the Vortex Optics Strike Eagle? As we stated earlier, the Strike Eagle has a spectacular star rating on Amazon. Honestly, there isn’t anything negative that can be found on this reliable, sturdy product. Customers have written reviews and then later updated the reviews with stating how wonderful their rifle scope continued to perform. It’s durable, reliable, durable and even comes with a hat and extra battery pack! If you are shopping for something with a budget of $1,000 and under, here’s a great rifle scope on Amazon. If you want to find a rifle scope that fulfills all of your needs, why not find one that also has night vision capabilities? That way, you can locate your targets in the darkest of night or the lightest of day. The Armasight Vampire can fulfill that need for you. Let’s take a look at the details and all that this great rifle scope has to offer. For starters, it has an excellent star rating on Amazon and is available for under $1,000. The Armasight Vampire is constructed from strong, sturdy, solid aluminum. The O-ring is tightly sealed and coated with rubber to protect it from dust and other environmental elements. It’s also treated with nitrogen to ad in the prevention of internal moisture. The waterproof, sand proof and fog proof design allows the shooter to operate through nearly any environmental condition. The illuminated reticle comes with a convenient brightness adjustment. It has a detachable, long range infrared illuminator. In fact, the all-glass IR transmission has multiple coated optics that guarantee a high quality experience. The Armasight Vampire comes with a quick release mount that attaches to the standard Picatinny or weaver style rails. It’s also equipped with tactical rails for illuminators, such as the IR illuminator, and lasers. Last but not least, it has a convenient low battery indicator and comes with a limited two-year warranty. What are the customers saying about the Armasight Vampire? Many customers are stoked about the Armasight Vampire because it delivers the high quality as that of generation 1 tactical night vision rifle scopes. If you want the advantages of a generation 1 rifle scope, the Armasight Vampire is the rifle scope to choose. When you’re shopping for the best rifle scope for your AR-15, there are a few things to consider. First, it’s crucial to pinpoint the nature of your target. There are no two rifle scopes exactly alike. Each one serves certain aspects better than others. For instance, one rifle scope will work best for moving targets while other rifle scopes work best for still targets. Once you’ve acknowledged the nature of your target, the next details to investigate on the rifle scope is the reticle and magnification. Since the scope is designed to be your second pair of eyes, it’s important to know the sight strength and accuracy. Another important aspect to consider while you’re shopping is the brands. It’s great to be familiar with the top brands as they offer the best on the market. Finally, after you’ve educated yourself on the top brands, see what the customers are saying about the rifle scopes. Their feedback almost always gives you an idea of what to expect when you purchase the same rifle scope. As long as you’re familiar with these steps, you won’t have any trouble with finding a great rifle scope for your AR-15.